Yep, we’re going mobile again. Been in Florida since Dec 28, waited for the weather to turn really nice. It has turned really nice. And now we’re heading north. And we can, perhaps, watch the weather turn nice again, in NC this time. We made a valiant last try for the beach a few days ago. The day’s forecast was 80 degrees and sunny. We thought this was our best shot for good beach weather. It may have been the best day, so far, to go but wasn’t good enough to enjoy the beach. What we found was a great deal of cloudiness and terrible winds. The temperature was 77 but, with the winds, felt cooler. And the winds drove the sand so hard it was stinging. After a couple of hours we threw in the towel and picnicked on the grassy lawn by the parking lot. A lot warmer, sheltered from the wind, we considered spreading out a pair of towels and sunning. But enough was enough — time to go back to Okeechobee. Nice try, anyway. And our last try for an Atlantic Beach for this year, too. We’ll be heading west in a few weeks and won’t be in the Southeast until February 2011. We’re psyched about getting on the road, feeling the tires spinning under us again. It’s been awhile since we traveled more than one hundred miles. Have we forgotten how to do this? What will we forget to do? We’ve been making lists and checking them twice over the past week. Each day we’ve tried to so some of the preparation toward traveling. There were a surprising number of chores we found useful, ranging from recalibrating the holding tank sensors and checking the truck’s tire pressures, to restoring the entrance’s oak threshold strip to cleaning out totes and cargo compartments. We’ve eliminated a number of books and chemicals and some odd parts we decided had seen enough of North America already. It makes more space in our truck, saves some weight in the trailer (a great thing to do), and makes life a little simpler by having less to keep up with. replaced the grounding on the trailer’s HF antenna and amateur radio. We’re ready to go and will set out first thing Thursday morning for Chapel Hill, NC. It’ll be nice to hit the road with our home trailing behind us. We’ll take two days to get there, a nice pace to take for the mileage. It’s time to scratch our itchy feet, put some miles under us. We’ll probably talk to you next after we arrive in Chapel Hill. Until then, keep the rubber side down! One of the joys of having so little stuff is you have less to maintain and more to imagine. When you have a completely furnished workshop you spend part of every visit cleaning it back up again. 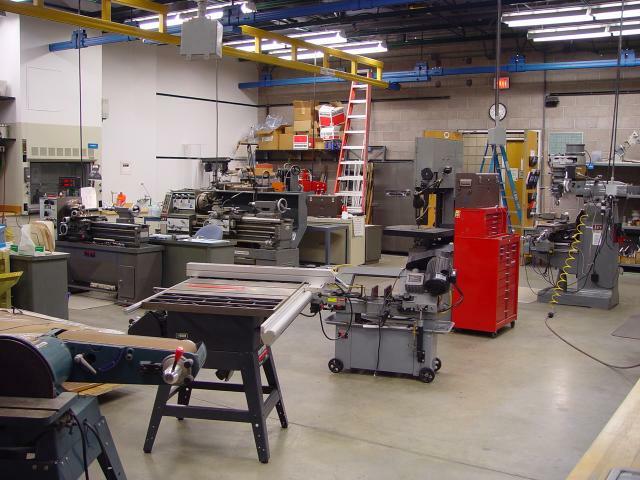 Sometimes you just go down there and tune up the equipment, tweaking the knives, polishing the milled surfaces. And you have the workshop ready to transform ideas into things — a workshop in which to create, modify, and destroy materials. But, once it’s furnished and arranged you are kinda locked into the investment you’ve already sunk. You’re limited in what you can imagine doing to the shop. Jim borrowed a neighbor’s workshop space yesterday afternoon. It’s very modest, just a small u-shaped area attached to his house. He has a few pieces of equipment, enough to do small woodworking. This served Jim’s purposes perfectly yesterday, just laying out, drilling, and deburring a dozen holes in a 1/8″ piece of aluminum for our fireplace. Anywhere else Jim would have done this with his 35 year old Black & Decker drill. But he had a choice here. The drill press made it far easier and quicker to do neat work on the anodized aluminum piece. And this got him to thinking about how nice it is to have a place to do stuff like drilling, cutting, shaping, grinding . . .
Now Jim’s dreaming up a workshop of his own. Jim started working, after college, as a carpenter then a maintenance mechanic. One job had him in charge and sole use of a 40′ X 40′ woodworking shop, fully equipped. He knows his way around workshops, and can recall and imagine just how he might arrange one for himself. This is pretty harmless — Jim’s too cheap to spend more than he needs to, and he doesn’t have a place for the stuff right now. While we’re mobile he doesn’t have any place to put another tool anyway. 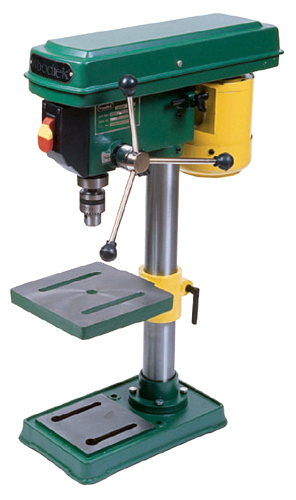 So he announced to me today he is shopping for a drill press. “Yeah, right, you gonna mount it on the truck’s bumper?”, I said. “Nah, this is for the shop I’ll have when we stop full-timing someday”, he answered. And with Popular Mechanic’s help he’s already figured out the specs for his drill press of the future. We aren’t accepting an early exit from full-timing, we’re both still enjoying this tremendously. He has plenty of time to dream up the appropriate shop and equipment. But I might be concerned if he finishes the shop plan and starts shopping for a place to put it. Okay, so a drill press and what else? This could go far, this imagining a workshop. We’re both listmakers, and we enjoy getting ideas onto paper, saving them to pore over later. And of course, the shop probably will become bigger than the house. I wonder if he’ll finish it and start listing projects to do in it, then virtually completing them? Dream on, baby, have a blast! I get to use the shop too.